For the second time in two games, the Washington Capitals had to use extra time to decide the game. Same story, different outcome though as the Caps got shootout goals by T.J. Oshie and Evgeny Kuznetsov to beat the Detroit Red Wings 3-2 at Verizon Center. The Caps, 8-1-2 in their last 11 games, have taken points in eight straight. The Capitals improved to 19-5-2 (40 points) this season, marking the team’s best start (in terms of points and wins) in franchise history. Justin Williams has been working for four games to get his NHL 600th career point. He finally got it with the opening goal and gave Marcus Johansson his 200th on the assist as well. The NHL free agent signing period starts July 1, and the Washington Capitals find themselves in a potentially franchise-altering position. They have several unrestricted free agents that will leave sizable holes in the roster, several more restricted free agents that potentially move as well, and after last week’s draft, still need to find a right winger to play on the top line with Alex Ovechkin and Nick Backstrom. First, the Caps free agents: Mike Green and Eric Fehr are both gone. The team has expressed that they will not make an offer to keep them in D.C and allow them to make their best deal on the open market. Green’s departure means that the only “Young Guns” left are 8 and 19, and that era is officially over, without so much as a Conference Finals to boast on. Fehr’s utility as a center and winger, depth scoring, and defensive responsibility will be a tough combo to replace, though his injury history makes it easier to swallow to let him go. As for the other significant UFA, the Caps have expressed interest in retaining Joel Ward, and they may very well make him an offer if they can work out the money. Ward has said he’d like to stay in D.C., but this is probably his “last best” contract and won’t settle for a hometown discount. The Caps have several RFAs as well, most notably Braden Holtby. The goalie’s breakout year should garner him a multi-year deal worth $5 million annually, and the Caps first priority is to lock him up. Marcus Johansson and Evgeny Kuznetsov are RFAs as well. The team has acknowledged they have approached Kuznetsov’s representatives, but have not started negotiations with Johansson’s. One development has already occurred. The team re-signed center Jay Beagle to a three-year, $5.25 million deal. It’s hard to imagine the offensively-challenged beagle commanding a $1.75M annual price tag, but the organization praises his hard work, defensive ability and face off prowess. As for acquiring a running mate on the right side of the top line, the Caps will probably have to look on the trading market as opposed to a free agent. They will once again be tight against the cap despite allowing Green, Ward and Fehr walk, and the market for scoring right wingers isn’t particularly impressive. At the recently concluded NHL Draft, the Caps surprisingly selected Russian goaltender Ilya Samsonov at the No. 22 overall pick, then traded up in the second round to pick add Swiss defenseman Jonas Siegenthaler at No. 57, before taking Regina Pats defensive teammates Connor Hobbs and Colby Williams in the fifth and sixth rounds. The four picks are the fewest the Caps have ever made in a single draft. All in all, the 2015-16 Caps could look significantly different than the team that got booted in the second round this season. GM Brian MacLellan will have his hands full the next few weeks bringing everything into shape. The pending list of free agents for the Washington Capitals includes several big names, but while there is little question that players like Braden Holtby and Evgeny Kuznetsov will be re-signed, the future remains much more cloudy for defenseman Mike Green. Green was selected 29th overall by the Caps in the 2004 draft and has spent his entire NHL career with the organization. He will turn 30 in October so while his 30-plus goal seasons are likely behind him, he still has plenty of good years left in his career. Yet, the final year of Green’s contract has now come and gone with no extension in place. While there remains time between now and the start of free agency for the team to work out a deal, the chances of that happening seem unlikely. With the Washington Capitals out of the playoffs, the focus now must turn from the 2015 postseason to the 2015-16 season. There truly is no rest for the weary as the Caps now must face several key offseason questions. Despite how the season may have ended, Barry Trotz’s first season behind the bench in Washington was a successful one — he led the Caps back into the postseason and came within one win of knocking off the President’s Trophy winners, but that only matters if the team is able to capitalize on the strides they made. 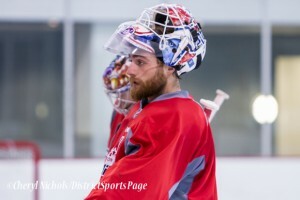 How much will Braden Holtby cost? Braden Holtby was absolutely phenomenal for the Caps with a .944 save percentage in the playoffs. In fact, Holtby currently owns the all-time highest career playoff percentage. Holtby also proved his worth in the regular season, playing 73 games and earning 41 wins. This is pretty good timing for the Saskatchewan native as he is now a restricted free agent. Before you start thinking about a blank check with a lot of zeros, however, the fact that Holtby is a restricted free agent does give the team the option of a “bridge” contract — a short-term deal to take him out of restricted status. Essentially a bridge deal allows for the player to make more money without the team having to commit to a long-term deal yet. At this point, however, what is there left for Holtby to prove? Bridge contracts can sometimes seem business savvy, but to give Holtby a “prove it” type deal after the season he just had seems silly considering that he also had a strong postseason showing in 2012. Other teams could also force the Caps’ hand. Restricted free agents can receive offer sheets from other teams which does not happen a lot, but for a budding star/elite goalie Holtby is sure to generate some interest from around the league. Chances are this won’t happen and even if it does, it seems unfathomable to think the Caps won’t match regardless of what the offer might be. So what is Holtby ultimately worth? Henrik Lundqvist currently has the highest cap hit among NHL goalies at $8.5 million, but that seems a tad unreasonable. Holtby falls much closer to the $6-7 million range, probably closer to the lower end of that spectrum given that Holtby has only been a starter for one full season. 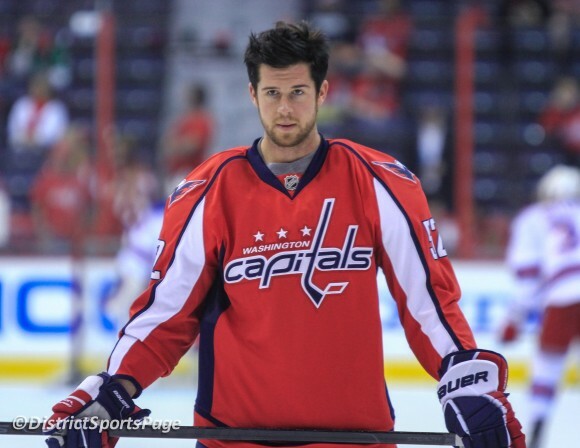 Will Mike Green be back? Mike Green is coming off a contract that paid him about $6 million per year and was a third-pair defenseman this season. Regardless of what anyone thinks he is worth, one thing is guaranteed: another NHL team will offer Green more money than the Caps will. That is a 100 percent, take it to the bank guarantee. How much more money he’s offered will ultimately determine whether he returns. While Green is on the third-pair with the Caps, there are other teams who will be willing to give him a bigger role on their team and therefore will offer him significantly more money. Green has made it clear he wants to stay in Washington and would perhaps be willing to take a paycut, but we are probably talking about several million dollars. That makes Green’s return unlikely. Who will be the top-line RW? Besides re-signing Holtby, finding a top line right wing will be a top priority this offseason. Given that Trotz tried just about everyone he could on that top line, this suggests the next right wing is either not on the roster or is still developing. If you think Marcus Johansson should be on the top line, that’s great. Trotz tried it and moved on. If you think Joel Ward should be on the top line, that’s great. Trotz tried it and moved on. The same goes for Troy Brouwer, Jason Chimera, Jay Beagle and Eric Fehr. Trotz tried all of these players on the top line and moved on from it. Coaches on every team shuffle their lines during games and over the course of a season, but not nearly as frequently as we saw from Trotz. Clearly, he was not satisfied with what he saw on the top line. Depending on how Andre Burakovsky and Tom Wilson develop this offseason, perhaps one of them can step into this role. Both players saw time on the top line over the season with some success. What makes them different from the others on the right wing merry-go-round is how young they are. We know who Chimera is as a player. We know what you get from a player like Ward and Beagle. Burakovsky and Wilson are still developing and are capable of growing into a top-line role if they progress enough over the summer. If the team decides neither of them are ready yet, they need to find someone to complete that line. The free agent class is rather thin, but Justin Williams seems like a potential target. He will turn 34 just as the season starts and could bring veteran leadership and Stanley Cup experience to the roster. If general manager Brian MacLellan doesn’t like what he sees among the free agents, then he will have to put some kind of trade package together to find one. Trading for a top-line player is expensive, however, and MacLellan will try to avoid this option if he can. The fact that Holtby played in 73 games this season says just as much about how Trotz feels about backup Justin Peters as it does about Holtby. Peters finished the season with a 3-6-1 record and a .881 save percentage. That’s not good. At times, Peters did not play as bad as his numbers and often did not get a lot of help in front of him but when you play so little it becomes impossible to develop a report with the defense thus compounding the problem. When Holtby was sick for Game 2 in the playoffs against the New York Islanders, Philipp Grubauer was recalled from the AHL and started over Peters. That should tell you all you need to know. Considering that Trotz did not anticipate leaning on Holtby this much coming into this season, just think of what will happen next season now that he knows what he has in both Holtby and Peters. Clearly, something needs to change. Having Holtby play so much is not a recipe for success, this team needs a backup they can rely on. Perhaps the answer is Grubauer. Grubauer was very good in Hershey this year and has not looked out of place in his appearances at the NHL level. He is still young and no doubt would benefit more from getting consistent playing time rather than serving as a backup, but the team needs to evaluate what his role with the team will ultimately be if Holtby is going to be the long-term starter. With one year left on Peters’ deal, it seems doubtful that the team will sign another backup. If Grubauer does backup Holtby next year, Peters could go to Hershey where he posted a .948 save percentage and one shutout in three games this season. If Trotz has no faith in Peters — which seems to be the case — it makes no sense to go into next season with Peters as the backup. Who will the Caps re-sign? Let’s go over the easy ones first. On defense, Green, Tim Gleason and John Erskine will almost certainly be gone. Nate Schmidt is a restricted free agent and the team will want him back. We’ve already gone over Holtby. On offense, both Evgeny Kuznetsov and Johansson are restricted free agents and there is no reason to think either will not be back, especially Kuznetsov. Aaron Volpatti will be gone. Curtis Glencross was a deadline acquisition and was a healthy scratch for four games in the playoffs including Game 7 against the New York Rangers. Chances are the team will move on. That leaves Ward, Beagle and Fehr. With nine points in the playoffs, Ward is someone the team would probably like back, but he was already overpaid on his last contract at $3 million per year. He would have to take a significant pay cut to stay, but at 34, this will likely be the last ‘major’ contract Ward gets. This is a deal MacLellan will get done if he can, but the ceiling for how much Ward can ask will be pretty low before he gets out of MacLellan’s price range. There is mutual interest in Beagle returning, but the problem with someone like Beagle is that he is ultimately a third- or fourth-line player. If he tests free agency there will be a team willing to overpay for him. It won’t take much to out-bid the Caps. If he’s not locked up before July 1, he’s as good as gone. Fehr is a great fit at the third line center and if Burakovsky goes to the right, the team will seek to bring Fehr back. Considering Washington is the only place where things have really clicked for him in the NHL, he will want to stay if at all possible. What can we expect from the younger players next season? The long search for a second-line center mercifully appears to be over. Kuznetsov had a breakout postseason scoring five goals and two assists. Caps fans should be drooling over what he can turn into when he reaches his potential. Wilson was a first-round draft pick which means the Caps saw potential in him as a top-six forward. MacLellan told the media as much on Monday. He is the young player who needs to take the biggest step forward this summer to become a top-six wing. Depending on whether Ward returns, Wilson will likely start on the second or third line with a chance to prove himself. If he finishes the season on the fourth line again, then it may be time to consider whether the damage done to his development from Adam Oates’ tenure may be permanent. Burakovsky started the season with the Caps, finished it in Hershey but was called back up to the NHL for the playoffs. He managed three points in 11 games, but looked impressive at times. It seems likely that his time in Hershey is over. Burakovsky’s impact next season will be determined by what position Trotz uses him in. At the start of the season, Burakovsky was playing center, but developing two rookies at center in the same season is a difficult task and he was moved to wing. If he develops enough to challenge for the top-line wing, that’s where he will be. If not, don’t be surprised to see him back in the faceoff circle next fall centering the third line. Given that Schmidt was recalled in the playoffs when Tim Gleason’s health was in question and that Schmidt was Hershey’s leading scorer in the playoffs despite being a defenseman and playing in only eight of the team’s 10 playoff games. It would be a surprise if he was not with the Caps next season with Dmitry Orlov as the team’s third-pair. That would give the team six defensemen leaving Connor Carrick as the odd-man out. He should spend the summer trying to pack on as much muscle as possible onto his small frame. As for some of the other notable prospects — Riley Barber, Madison Bowey, Jakub Vrana — it would be unreasonable to expect anything from them at the NHL level next season. Neither Barber nor Bowey have spent any time in the AHL and Vrana has played only 13 games with Hershey. All three are expected to start next season with the Bears. If they end up making any impact with the Caps next season, consider that a bonus. The Washington Capitals had a busy 24 hours, heading to Detroit’s Joe Louis Arena after a tough overtime loss to the playoff hopeful Ottawa Senators on Saturday night. The Detroit Red Wings, another playoff contender, are beset by injuries, and fielded a team without physical players such as Justin Abdelkader, Erik Cole, and Johan Franzen. The Red Wings came into the game 5-9-2 in their past 16 games, but had the return of forward Drew Miller from injury and were able to beat the Minnesota Wild last night in a shootout. The last time the two faced off in January, the Capitals came away with a 3-1 victory. The Caps were able to exploit Detroit’s injury woes, coming away with a critical two points. With the New York Islanders idle and the Pittsburgh Penguins losing to the Philadelphia Flyers, the Caps’ win helped to launch them back into second in the Metropolitan division standings, one point ahead of the Islanders and four ahead of the Penguins. Pending the result of the other games tonight (Ottawa vs. Toronto), the Capitals’ victory helped to solidify their standings and another chance to lock up a playoff slot. After a few possession changes early, the Capitals earned a power play at when Daniel Cleary got called for high-sticking on Brooks Laich 1:51 into the game. The Caps had trouble finding lanes to the net for the first minute of their power play, but took advantage of their opportunity. A lucky bounce for Evgeny Kuznetsov found the stick of Detroit’s Drew Miller, a deflection that launched past goalie Petr Mrazek and gave the Caps an early lead. Matt Niskanen and Mike Green were credited with the assists. Alex Ovechkin drew a holding call at 10:18 on Henrik Zetterberg. Detroit pushed hard, but faced good defensive play from the Caps and were unable to convert to tie the game. The second period started with heavy pressure from the Red Wings, keeping the Caps on their heels as they tried to fend off plays from the point and slot. Braden Holtby did a great job of turning away pucks, limiting rebounds that would have led to opportunities. The sustained pressure led to a penalty call as Brooks Orpik drew a tripping penalty on Luke Glendening at 1:56 while trying to clear the front of the net. Fortunately, the Caps defense forced most of the chances for Detroit to the outside and prevented scoring opportunities. 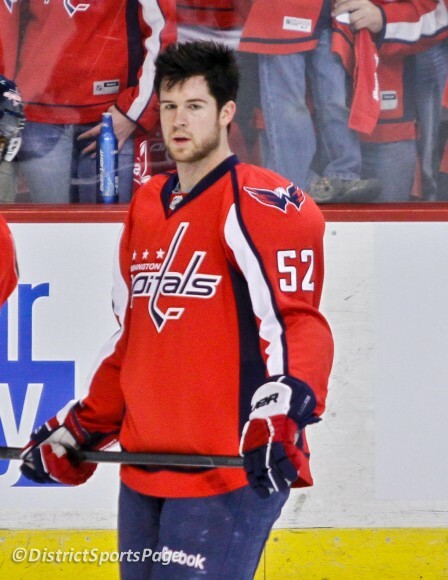 Mike Green proved his slapshot is back at 4:42 of the second. Blasting a rocket from the top of the faceoff circle, Green’s shot glanced off defenseman Drew Miller and found a way past Mrazek’s glove, careening into the top of the net to give the Caps a 2-0 lead. Both Tim Gleason and Alex Ovechkin had assists on the goal. At 5:38 of the period, the Capitals had an opportunity to put the game out of reach and take a big lead when the Red Wings were called for too many men on the ice. Despite the free chance, the Caps could hardly put any oomph into their power play and had issues with turnovers. Another opportunity presented itself when Marek Zidlicky was called for clipping at 10:28, upending Tom Wilson on the blue line. This time, the Caps kept the puck in the Red Wings zone but were unable to find a lane to the net. With the penalty winding down, the Caps put pressure in front of the net, but it led to a goalie interference call against Joel Ward when he lunged for the puck behind Mrazek at 12:14 of the period. The Red Wings quickly capitalized on their power play and forward Darren Helm scored his 14th goal of the season, a chip-in shot at 12:59 of the period. Pavel Datsyuk was responsible for setting up Helm, with another assist credited to Teemu Pulkkinen. The Red Wings had a great chance to tie it up with the second period winding down when Mike Green was called for a delay of game penalty. 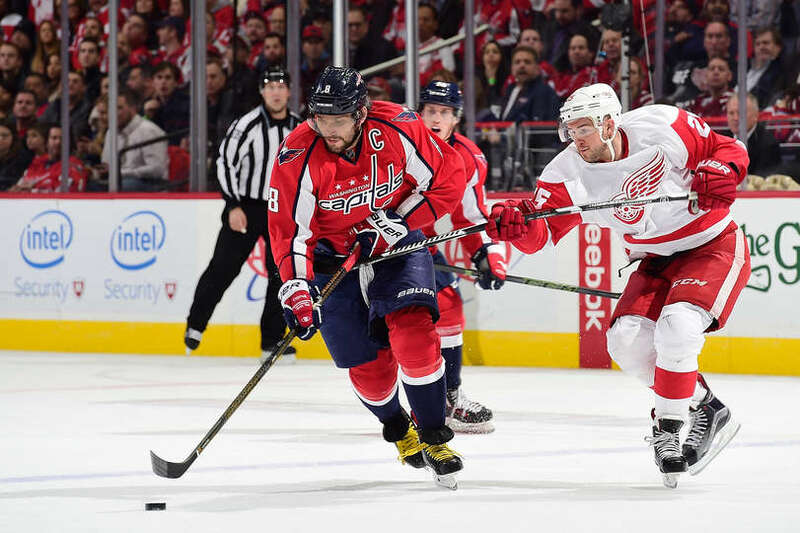 After a couple of close calls and rebounds, the Caps were able to move the puck out of the zone — but Troy Brouwer used his glove to clear it, drawing another penalty and giving the Red Wings a two-man advantage for a minute and a half. Fortunately for the Caps, the Wings were unable to synchronize their power play and set up a goal-scoring play. A couple of timely clears helped out, preventing Detroit from finding the tying goal. Braden Holtby had an incredible split that left Caps fans mesmerized, but also concerned about the immediate impact of a groin injury. Thankfully, bad news was averted as the Caps trainer quickly cleared Holtby of any serious injury and he played on. The third period started slowly, with the Caps playing conservatively to maintain the lead. They were active when needed to turn away the Wings rushes, but also relied heavily on Holtby who turned away several shots from the points and the ensuing rebounds. Given the close game, the Caps wisely shied away from drawing penalties to ensure that Datsyuk and the Wings wouldn’t have another power play opportunity. Holtby had another impact game, with key saves to keep the Caps in the game. The second and third periods shots on goal were dominated by Detroit, but Holtby stayed strong and kept the Caps in the lead. Mike Green has had some big goals of late. His blue hockey stick has been magic, making significant and timely contributions to the Caps goal-scoring efforts. Unnecessary and unfortunate penalties. The dazzling goaltending of Holtby has bailed the Caps out for much of the regular season, but this trend has to stop as we look towards the playoffs. Red Wings’ left wing Drew Miller had a tough night, with both of the Caps goals coming via deflections off him. He might want to watch his stick and glove for the next few games. The Washington Capitals entered Saturday night’s game with a chance to clinch a playoff spot, but they will have to wait at least one more day after losing to the desperate Ottawa Senators in overtime. The Washington Capitals took care of business Tuesday night. They scored early, they responded to a couple of their opponent’s goals, and the best player in franchise history added to his accolades. At the finish, the Caps beat the Carolina Hurricanes 4-2 before a not-quite capacity Verizon Center. With the two points, the Caps pull within a point of both Pittsburgh and the Islanders, tied for second in the Metropolitan Division and both idle, while further distancing themselves from the now-remote possibility of missing the playoffs. The Caps got things started early in the first. On a good cycle, Curtis Glencross and Tom Wilson kept the puck deep in the Carolina end and Mike Green snuck into the slot, took the pass from Wilson, and beat Cam Ward for his eighth goal of the season. Then, the moment everyone was waiting for. Midway through the frame, Evgeny Kuznetsov entered the offensive zone carrying the puck, drawing the defense to him. He backhanded it to Ovechkin on the left wing, and the Great Eight whipped it past Ward glove-side for his 50th of the season. Ovechkin becomes the sixth player in NHL history to record six 50-goal seasons, joining Mike Bossy (9), Wayne Gretzky (9), Marcel Dionne (6), Guy Lafleur (6) and Mario Lemieux (6), and with that goal he tied Peter Bondra for the Caps all-time leading goal scorer, with 472 career goals. But nothing comes easy for this team. Carolina halved the lead exactly five minutes into the second, as Alexander Semin beat Karl Alzner and Nathan Gerbe was able to take advantage and beat a defenseless Braden Holtby. Later, Tom Wilson got pick-pocketed in the offensive zone, sending the play the other way. Eventually, Chris Terry found Eric Staal completely alone on the doorstep, and Stall buried into the open net to tie the game at two. The Caps recaptured the lead at 17:06 of the second. Jason Chimera made a really hifty backhanded pass to Brooks Laich, who was streaking through the slot. Laich deked, and slipped the puck past the fallen Ward. Then, while P.A. announcer Wes Johnson was calling the goal, they scored again. Ovechkin slid it through the crease to Joel Ward, who got enough of the puck to get it past Ward to make it a two-goal game again. With the assist, Ovechkin tied Michael Pivonka for No. 2 on the team’s all-time assist leader list. All that was left was for an uneventful third period to play out, which it did. The Caps resume play Thursday in Montreal. Exasperated sighs and disappointed faces told the tale on Saturday afternoon in the Washington Capitals locker room. Squandering an early 5-on-3 power play, the Caps spotted the Nashville Predators a 3-0 lead before clawing back to pull within a goal twice. A late flurry of shots with an extra attacker wasn’t enough, and Washington ultimately fell 4-3 to the Predators at Verizon Center. The Ottawa Senators had plenty of opportunities in the third period to tie the game, but Braden Holtby and the Washington Capitals’ penalty killers came up big in the third period to preserve a one-goal lead. As the teams return from the All-Star Break and meaningful hockey starts again, the next big day on the NHL calendar is the trade deadline. The NHL trade deadline is on March 2 at 3 pm, just over a month away. The task for each team over the next few weeks is to determine what their realistic goals are for this season and going forward so that they can determine if they will be buyers or sellers at the deadline. On an individual level, general managers need to determine the future of their pending free agents, i.e. who they will seek to re-sign and who already has one foot out of the door.